The Starfires experienced another winning week last week and continued a strong fall effort. The week was started by a big football victory as the JV team finished the sweep of Bellmont with a 40-8 win and the week was capped by a dominant performance from the varsity football team with their 56-0 win over the Bluffton Tigers. The Starfires scored every time they touched the ball before half-time, getting touchdowns from Marcus Teeter, Joe Stuber, JD Groh, and Isaiah Baumgartner while Nick Stuber added the only score of the second half. The defense matched the offensive output by only allowing Bluffton to gain 28 total yards for the game during the shutout. Volleyball went 2-1 in their matches this week. Monday, the Starfires overpowered FW South Side with a very quick 3-set match. Tuesday, the ladies traveled to Parkway but were defeated by a feisty Parkway team in 4. We finished the week with a strong performance vs. Norwell defeating the Knights in 3 sets. Tennis defeated Blackford but lost to Union City. David Muselman continued his undefeated season to lead SA. 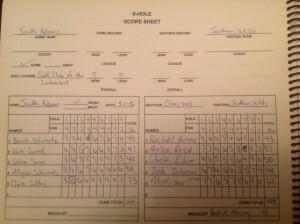 Golf lost vs. Southern Wells by 1 stroke. Boys Soccer was defeated by Norwell Saturday by a score of 5-0. The Cross Country girls won the Bi-County meet Tuesday; however, the boys race was canceled due to lightning. Saturday, they competed at the Marion Invitational. The girls finished 12th in the elite division and the boys finished 17th.